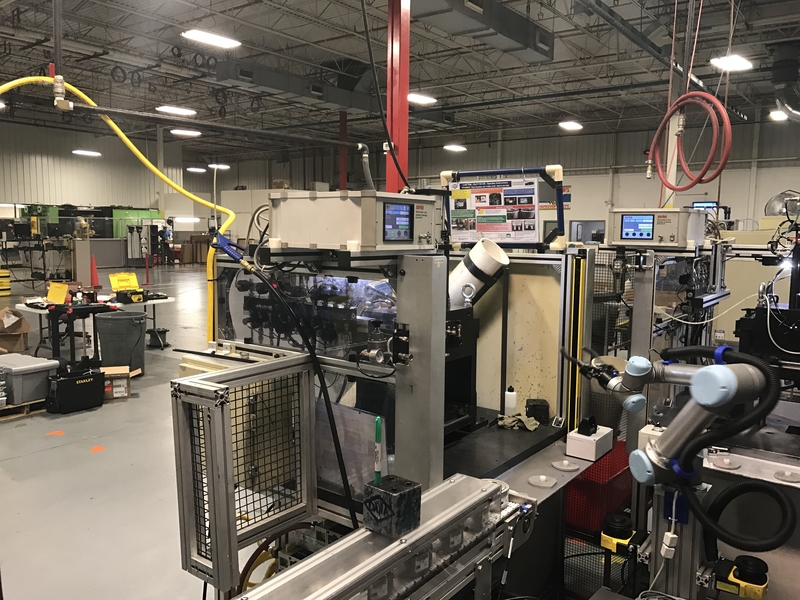 We recently deployed a UR5 into a machine tending application where the robot is running 5 separate pieces of equipment, 3 machines and 2 conveyors. Because of the tight space of the cell and the speed at which the robot is operating to be able to keep the three machines busy all the time the customer was worried about someone entering the cell and being struck by the fingers on the 2F85 gripper as they are rather long and "pointy" as well as the part that we are carrying has a couple of sharp edges. We discussed several different solutions with them including using a safety rated door to enter the robot space, light curtains, safety mats and area scanners. In the end we chose to deploy two safety area scanners mounted directly to the robot base. This gives us a full 360 degree sweep of the robot so that there are no blind spots anywhere in the cell. We mounted the scanners directly to the robot so that if we want to move the robot to another location to work the scanners go directly with him and there is no need to mount them at another location. One of the nice features of the Omron OS32C scanner is the ability to have up to 70 zones preprogrammed on the scanner. Then using 8 digital inputs you are able to select the exact zone that the scanner should be using. This could allow the robot to be preconfigured to work in several cells and then the top of the program could define which cell its currently in and the scanner would be scanning for the correct configuration. We have pulled the robot out of the cell and put it back about 3 or 4 times so far and have had no issues with the scanner not scanning the area correctly. We connected the scanners to two safety relays, both scanners A circuit to one relay and B to the other and then connected each relay to one of the pair of safety inputs on the robot. This way if either sensor detects an issue or faults the robot will go into reduced mode. You can see the two scanners on the column of the robot. 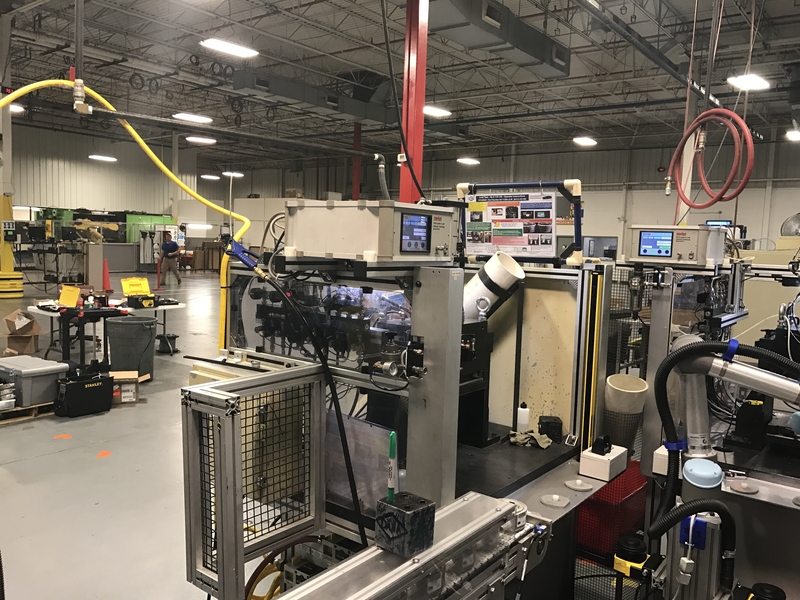 If you look in the background you can see a Fanuc 420S which is seriously handling a part that weighs less than 1 pound!